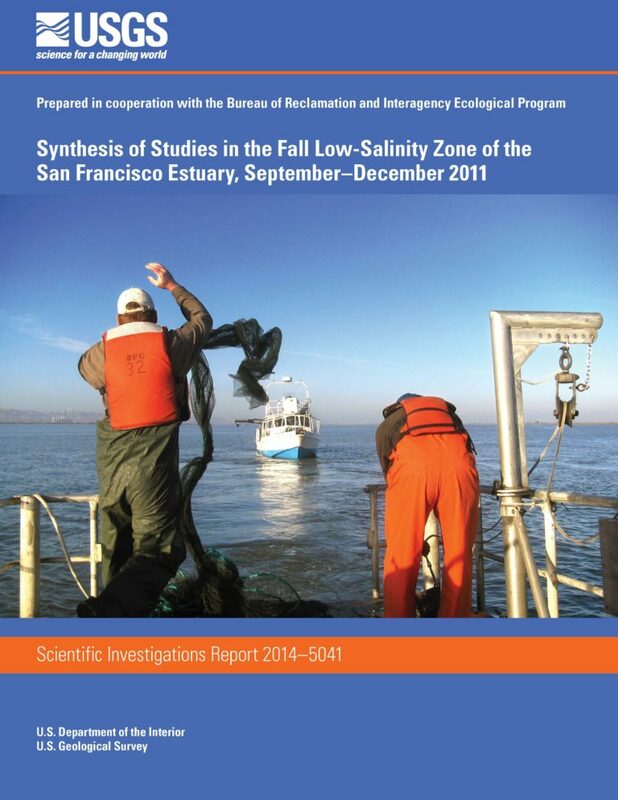 In fall 2011, a large-scale investigation (fall low-salinity habitat investigation) was implemented by the Bureau of Reclamation in cooperation with the Interagency Ecological Program to explore hypotheses about the ecological role of low-salinity habitat in the San Francisco Estuary—specifically, hypotheses about the importance of fall low-salinity habitat to the biology of delta smelt Hypomesus transpacificus, a species endemic to the San Francisco Estuary and listed as threatened or endangered under federal and state endangered species legislation. The Interagency Ecological Program is a consortium of 10 agencies that work together to develop a better understanding of the ecology of the Estuary and the effects of the State Water Project and Federal Central Valley Project operations on the physical, chemical, and biological conditions of the San Francisco Estuary. The fall low-salinity habitat investigation constitutes one of the actions stipulated in the Reasonable and Prudent Alternative issued with the 2008 Biological Opinion of the U.S. Fish and Wildlife Service, which called for adaptive management of fall Sacramento-San Joaquin Delta outflow following “wet” and “above normal” water years to alleviate jeopardy to delta smelt and adverse modification of delta smelt critical habitat. The basic hypothesis of the adaptive management of fall low-salinity habitat is that greater outflows move the low-salinity zone (salinity 1–6), an important component of delta smelt habitat, westward and that moving the low-salinity zone westward of its position in the fall of recent years will benefit delta smelt, although the specific mechanisms providing such benefit are uncertain. An adaptive management plan was prepared to guide implementation of the adaptive management of fall low-salinity habitat and to reduce uncertainty. •To provide a summary of the results from the first year of coordinated fall low-salinity habitat studies and monitoring. •To provide a synthesis of the results of the fall low-salinity habitat studies and other ongoing research and monitoring, to determine if the available information supports the hypotheses behind the adaptive management of fall low-salinity habitat as set forth in the adaptive management plan. •To begin to put the results from the fall low-salinity habitat studies into context within the larger body of knowledge regarding the San Francisco Estuary and, in particular, the upper San Francisco Estuary, including the Sacramento-San Joaquin Delta, Suisun Bay, and associated embayments. A vast watershed connects the mountain streams surrounding California’s Central Valley with San Francisco Bay and the ocean beyond. Over the course of the last two centuries, much of the natural productivity, biodiversity and ecological integrity of the watershed has been destroyed by modifying the environment without fully understanding the long-term environmental consequences. Long the site of some of the nation’s most intensive conflicts over the use of land and water resources, this system is now emerging as the focus of one of the most ambitious ecological restoration efforts ever undertaken in the United States. This report was designed to provide a coherent and defensible ecological framework and information base for restoration. The need for such an historical, broad-scale perspective on system ecology stems from two fundamental principles of ecological restoration - the need to manage toward a natural template and to manage at ecosystem and landscape levels. This Issue Paper, authored by Jessica Davenport, the Council's Program Manager for Ecosystem Restoration and Land Use, is entitled Restoring Habitat with Science and Society in Mind. 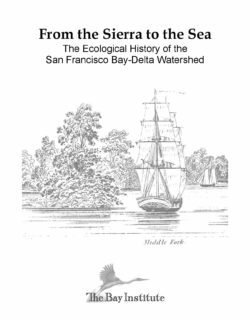 The purpose of the 22-page paper is to survey restoration activities in the Delta; describe the needs, progress and opportunities related to restoration; and propose key areas of focus for the Delta Stewardship Council and other agencies to advance habitat restoration. 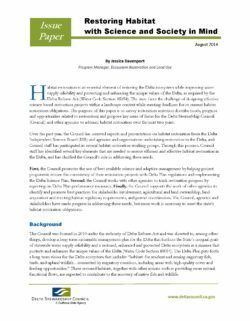 Continue to provide early consultation on habitat restoration projects that are Covered Actions under the Delta Plan in order to advise project proponents on using best available science and adaptive management and avoiding or reducing conflicts with existing uses, where feasible. Report on habitat performance measures by December 2014 and again in December 2015. Work with others to complete at least one of the landscape-scale conceptual models and associated landscape habitat metrics for the priority habitat restoration areas. Enagage Delta Plan Interagency Implementation Committee members in discussions of challenges and potential solutions related to land acquistion and permit coordination. The Bay Institute's primer Gone with the Flow describes in plain language how runoff flowing from the mountain watersheds ringing California’s Central Valley provided coldwater paradises for salmon returning to their native streams; turned lowland rivers and their floodplains into a rich source of food and shelter for young fish; mingled in the Delta’s complex maze of marshes and sloughs; and created a vast expanse of brackish water habitat essential for estuarine creatures in the upper reaches of San Francisco Bay. 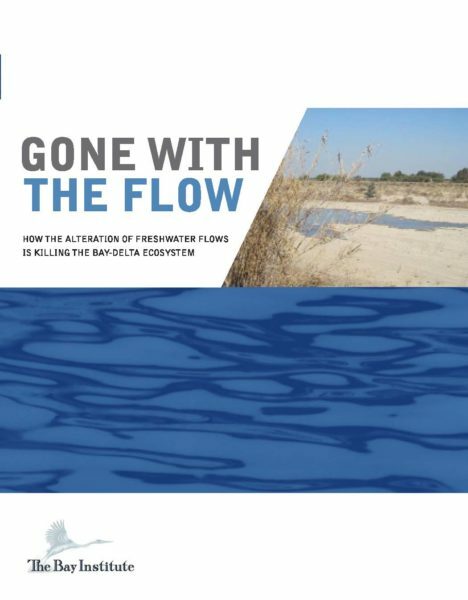 The primer also explains how the lack of access to most upland streams now forces migratory fish to cope with undesirable, often lethal flow conditions; how runoff in lowland rivers has been shifted from spring to summer, or even almost completely cut off in the San Joaquin basin, with disastrous consequences for the environment; how reverse flows in Delta channels kill hundreds of millions of aquatic organisms each year; and how the Bay is now in a permanent ecological drought because of the diversion of half its freshwater inflow. 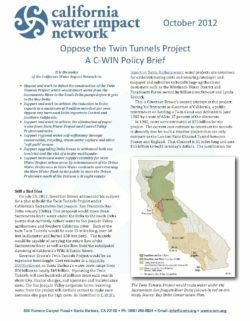 • Oppose and work to defeat the construction of the Twin Tunnels Project which would divert water from the Sacramento River to the South Delta pumps before it gets to the Bay-­Delta. • Support and work to achieve the reduction in Delta exports to a maximum of 3 million acre-­feet per year. Oppose any increased Delta exports to Central and Southern California. • Support and work to achieve the elimination of paper water from State Water Project and Central Valley Project contracts. • Support regional water self-­sufficiency through conservation, recycling, storm water capture and other “soft path” means. • Support upgrading Delta levees to withstand both sea level rise and the risk of a major earthquake. the Urban Preference south of the Delta as a drought supply.